Videographer Gemma Givens will cover the UN's conference on climate change for two organizations. Photo by Carolyn Lagattuta. This December, sophomore Gemma Givens will attend the United Nations international conference on climate change as a "backpack journalist," reporting on events for a nonprofit youth sustainability network and the Indigenous Environmental Network. For Givens, the trip represents an opportunity to integrate three passions: journalism, environmentalism, and indigenous rights. She is hopeful that the presence of large numbers of young people will impact the outcome of the conference, during which world leaders will negotiate a global climate treaty. "The decisions coming out of Copenhagen are going to affect my generation and my children's generation," she said, expressing hope that the presence of young people will help shape a successful outcome. "I hope we can be heard." Givens was one of only 27 young people chosen through a nationwide competition to attend the conference as a member of a delegation from SustainUS, an organization focused on sustainable development and youth empowerment. The only indigenous member of the team, Givens will attend as part of the communications group. A videographer, she will provide multimedia coverage of youth participation during the negotiations. She will also represent the Indigenous Environmental Network as part of their Native Youth Delegation. Givens, who was born in Guatemala, was adopted at the age of three months and raised in El Cerrito with virtually no awareness of her ethnic background. Of Kachiquel Mayan and Yaqui descent, she embraced her ethnicity and culture at the age of 14. Since then, she has pursued opportunities to learn more about indigenous issues. Last spring, she attended the Indigenous Peoples' Global Summit on Climate Change in Anchorage, Alaska. "I'm privileged not to be living on the front-line of climate change," she said. "But it was really different to meet my counterparts from Tanzania and Samoa, because they're feeling the effects now. It was a real wake-up call for me." 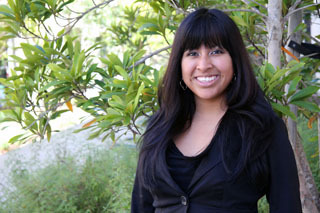 During the summer, Givens attended the American Indian Journalism Institute in South Dakota, which she likened to a 10-day "multimedia boot camp." A budding photojournalist and videographer, Givens looks forward to collaborating in Copenhagen with other U.S. and international youth climate activists to engage policymakers at the international level. SustainUS will push for a "bold, binding and just international climate treaty with science-based targets" to slow the pace of climate change. "I will also closely follow and advocate for the rights of indigenous peoples," she said. To prepare for Copenhagen, Givens enrolled this fall in Michael Loik's class, "Ecological Forecast for Global Warming." "She's been very proactive," said Loik, an associate professor of environmental studies. "She has this gigantic binder of things she's reading to prepare. She's a real go-getter." Givens will earn academic credit for participating in the conference by writing a paper and preparing a report, which will likely take the form of a video, said Loik. "She enrolled in my class and sent me e-mail months before to tell me about Copenhagen and ask if she could meet with me," recalled Loik. "She seems really, really self-motivated." As a freshman last year, Givens "talked her way in" to upper-division classes, taking courses in American studies about Native American women and cultural representation. This fall she is taking an upper-division politics class in international law. "I can see how all this has come at the right time to prepare me for Copenhagen," she said. "So much has conspired to help me for quite a long time now." Keep up with Givens in Copenhagen by visiting SustainUS.org and ItsGettingHotInHere.org--Dispatches from the Youth Climate Movement.